Upcoming Seminar - Sraddha to Nistha and Beyond ~ The Toronto Hare Krishna Temple! 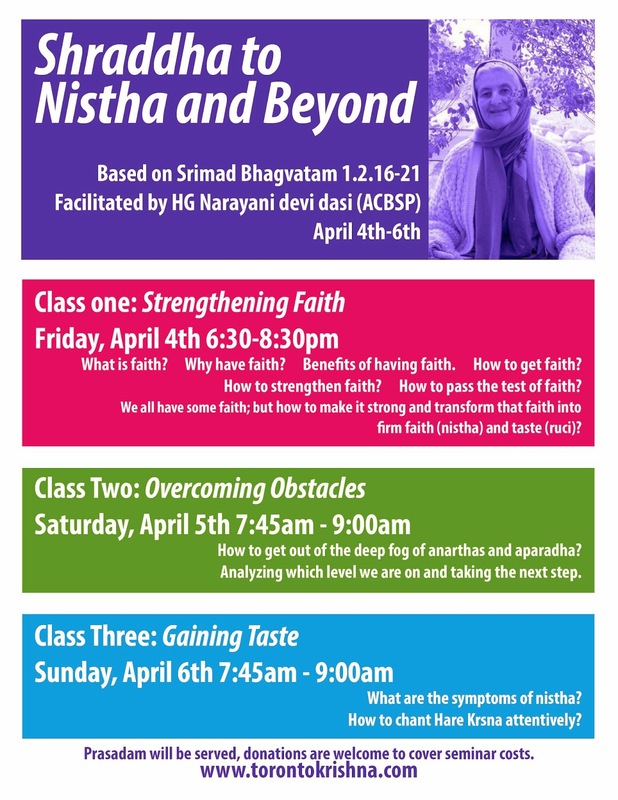 We are very excited to announce an upcoming seminar entitled, "Sraddha to Nistha and Beyond" with Her Grace Narayani devi dasi from Friday, April 4th - Sunday, April 6th at the Toronto Hare Krishna Temple. Devotional service begins with a seed of faith (sraddha), which is nurtured through association and devotional practices, and gradually progressing through the various stages of bhakti, prema or love of God develops. Through this seminar series, Narayani devi dasi will share philosophical insights as well as practical tips for one to fast track their bhakti journey. Her Grace Narayani devi dasi joined ISKCON in Boston in 1970. She has done many services for Srila Prabhupada including Deity worship in Calcutta temple, traveling book distribution in Western India for the Bombay temple and teaching Bhakti Sastri, Bhakti Vaibhava and Bhaktivedanta courses in the VIHE in Vrndavana. She helped write the VTE curriculum for Bhakti Sastri and has written three books: Srimad Bhagavatam At a Glance, Garden of Devotion and Bhagavad-Gita at a Glance. As always, prasadam (vegetarian meal) will be served after each class. Donates are welcome to cover seminar costs. If you have any questions, please email us at info@torontokrishna.com .